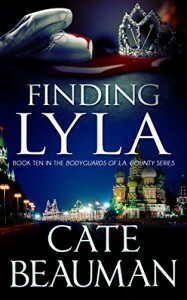 Cate Beauman does a wonderful job pulling you into this story as if you were living it. The places, people and situations were well crafted and interesting. My only complaint is that the beginning was very slow and I felt like the story was a bit dragged out. I think my reading time is more limited these days so these longer books are harder to get into. Lyla was an interesting character and I felt like we got some real insights into her background and history. The spark between her and Collin felt real as they experienced a very rough few weeks of life. As with most stressful situations, sometimes your partner in crime can be much more than that in the long run. Collin's character was well developed and I didn't have a problem keeping up with the story despite not having read any of the other stories in the series. The chemistry was great, the action was fun and the romance was well done. There was a lot going on in the world around them and I did enjoy the inclusion of other characters that really kept things moving. I would recommend this book to readers who enjoy a good romance with an interesting lead female and her "prince charming".